The details for these two bags are below. In the meantime – a little update on my life. I just realized when I checked my website that I hadn’t posted since Thanksgiving. Unfortunately, I had to put a few things on hold for the past month. My Mother was diagnosed with Bladder cancer this summer that was not treatable. So my sister planned a Thanksgiving getaway for all of us with our Mother (who lives in Buffalo). That was a great week and it turns out our last time together as a family. That week it was evident that she was declining quickly. I really think that she had held on for Thanksgiving. The following week she was in the hospital for 3 days, came home for a few days with support from Hospice. But we couldn’t manage her condition so she was admitted to an inpatient Hospice facility in Buffalo, NY. I have to say that the Hospice nurses are fantastic and were able to make her comfortable and manage her pain. She passed away very peacefully on December 10th. So I have just returned back home to the Boston, MA area. Needless to say – Christmas is the last thing on my mind. I have very little Christmas shopping done! So have some catching up to do! I am not sure how many Christmas cards will be going out from my house this Holiday Season. 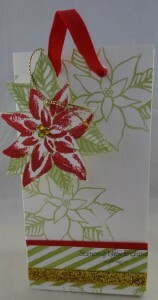 These bags use the Gift Bag punch Board (135862) which is very quick and simple to use! You can use any cardstock or Designer Paper for these bags. Something that is a little heavier than paper. Small Bag pictured above: 6 1/2″ long by 10″ wide. 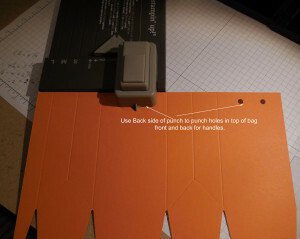 If you would like a shorter or taller bag – adjust the length of the cardstock. A small bag always has to be 10″ wide. Medium Bag Measurements: 7 to 10″ length by 11″ wide. A medium bag will always be 11″ wide. Large Bag Measurements: 8″ to 12″ wide. A large bag will always be 12″ wide. 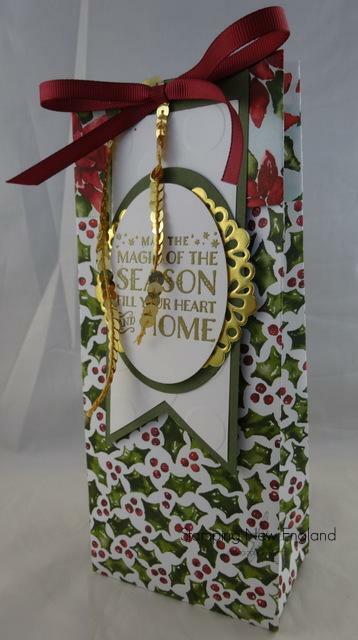 A full piece of 12″ x 12″ designer was used for the bag pictured above. 1. Line up the width of the paper (S=10″, M=11″, L=12″) with the line on the left side of the punch board that is labeled Start. 2. Mash the punch at the top of the board and score the line marked with the S, M or L based on the size of your bag. 3. Move the cardstock over so the line you just scored lines up with the Start Line. 4. Mash the punch at the top of the board and score the line marked side. Also score along the triangle and the center line to make the folds for the side of the bag. 5. Move the cardstock over so the Side line you just scored lines up with the Start Line. 6. Mash the punch at the top of the board and score the line marked with the S, M or L based on the size of your bag. 7. Move the cardstock over so the line you just scored lines up with the Start Line. 8. Mash the punch at the top of the board and score the line marked side. Also score along the triangle and the center line to make the folds for the side of the bag. 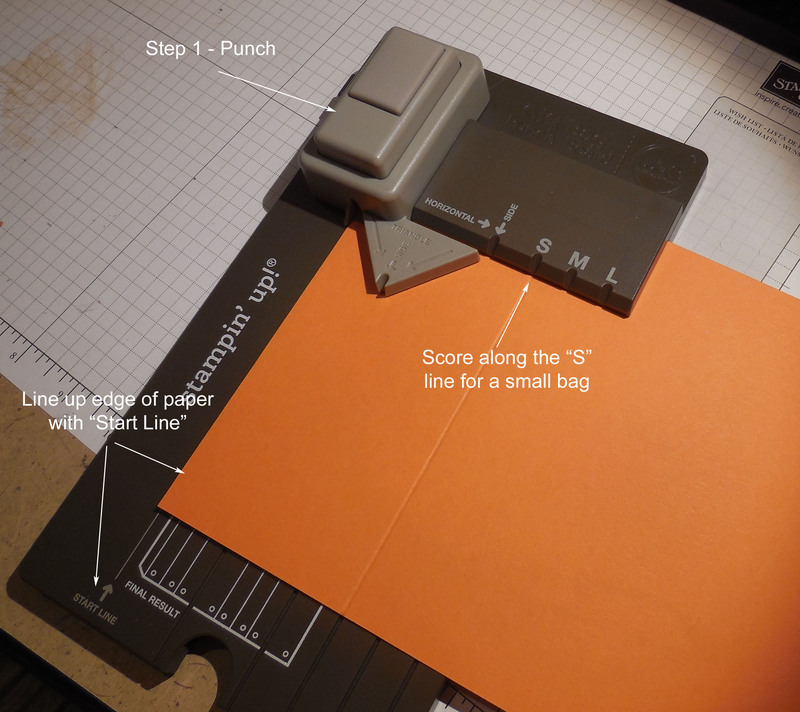 You will now have a 1/2″ piece that becomes your tab to assemble the bag. 9. 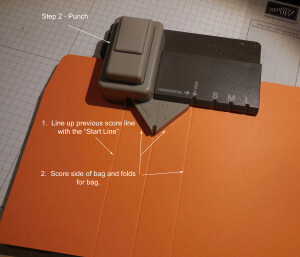 With a scoring tool, turn the cardstock and score along the point where the tabs meet so the tabs fold in to make the bottom of the bag. NOTE: if you are using Designer paper to make the bags – use the paper upside down if it is a one way design since the tabs that you punch at the beginning of each step become the bottom of the box. 10. At the top of the punch board is a double hole punch that works great to make holes for the front and back of the bag for handles. So line up/center the front side on the reverse side of the board and punch to make two holes. Repeat with the back side. 11. 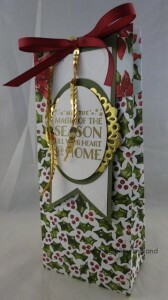 Fold along all the score lines and use Tear & Tape Adhesive to assemble the bag. Add two pieces of 8″ ribbon to make the handles. 12. That’s it! You have your custom gift bag! Occasions Catalog Share & Happy New Year!